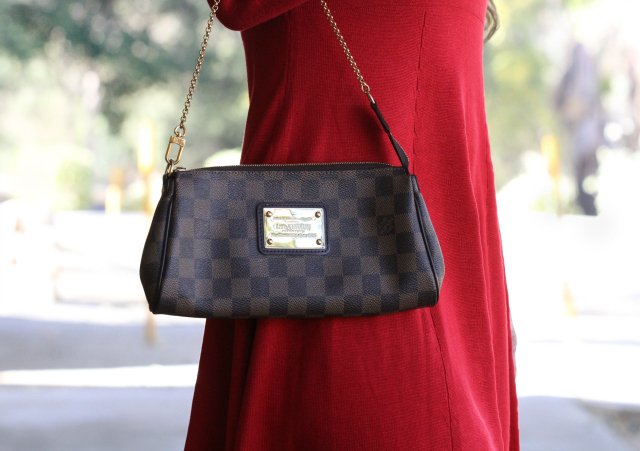 The little red dress: classic, timeless, and beautiful. It's also the next in a series of seasonal looks I've curated for you -- perfect for family gatherings, dinners, or parties that are filling up our calendars this time of year. 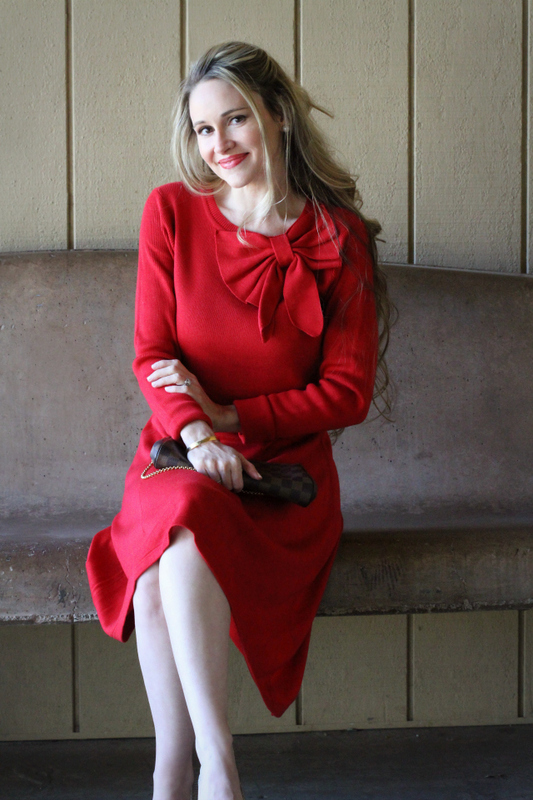 Isn't this red sweater bow dress just darling? I love that it's dressy, flattering, and oh-so-comfy! It's a great option for holiday parties, too (for those of you who celebrate) especially the office holiday parties where you want to achieve an elegant-yet-modest look. The sweater material is super soft and not itchy in the slightest, which is great for those of you with sensitive skin like me. Did I mention the extremely affordable price tag of $45? 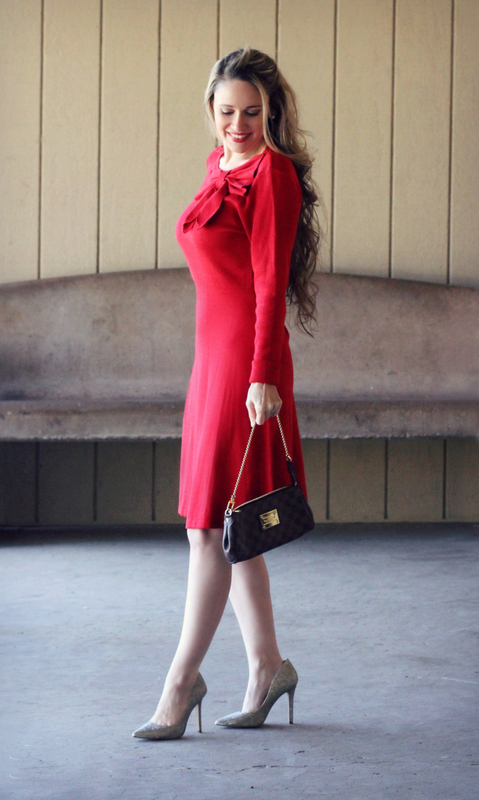 This is such a steal for a beautiful, classic red dress! Let's talk about the gathered bow at the neckline. Swoon! It's such a lovely detail -- not too large or garish -- adding just the right touch of feminine flair. The waist is slightly loose on me in the size Small but I prefer to leave some room for comfort. If you wanted a closer fit, I would suggest sizing down or having the waist/hips taken in to your liking. To add some sparkle and "glam" to the overall look, I chose gold, metallic pumps. These Vince Camuto pumps are beautiful with their simple, sleek silhouette. Sadly, they have sold out online, however these are nearly identical and are just as beautiful. The shimmery gold plays off of the richness of the red in the dress nicely, plus this color combo is so perfectly festive, isn't it? And if there's ever a time to pull out the sparkly pumps, it's now for all the fun festivities! These classic pearl stud earrings from Ann Taylor are easily some of my favorites; they look lovely with every outfit. They're understated yet elegant, and I wear them almost daily. You can snag them now for 40% off with code 'PARTY40', bringing them to just under $18! It is definitely an investment piece, and I am certainly not suggesting that you need an LV bag to complete this look. Any small clutch in a neutral color will work nicely. And if you're looking to add more interest, just choose a patterned or textured bag as I did here. Plaid is another seasonal favorite, which I infused into this look by wearing this plaid blanket scarf as a wrap. At only $15, it's a great way to add another layer of dimension (and some warmth!) to your outfit by featuring all of the traditional tartan plaid colors of red, hunter-green, and white. I hope you enjoyed this seasonal look! Stay tuned for more I'll be bringing to you soon!